Make your way to Main Street for music, a parade, bayou cuisine and more at the free, family-friendly, 5th Annual Mardi Gras on Main in La Porte on Saturday, February 16, 2019, from 4pm to 9pm. Returning for its fifth year, Mardi Gras on Main takes over La Porte for a free, family-friendly celebration featuring live music, crawfish, food trucks, markets, beer garden revelry, and more. If you’re wanting to join in on the festivities but avoid the drive home, then make sure you check out the hotel options in La Porte. Of course, Mardi Gras isn’t Mardi Gras unless there’s that familiar brass sound and there’s no shortage of music to get festival-goers shuffling their feet at Mardi Gras on Main. Known as “The Baddest Band on the Planet”, Bayou City Brass Band takes the main stage for their unique Gulf Coast sound that blends jazz, r&b, and hip-hop, with threads of the traditional New Orleans sound. Hitting the stage at 7pm, Keyun and the Zydeco Masters provide the bellowing tones of accordion and classic zydeco sound. This year, Mardi Gras on Main commences with the March to Mardi Gras. Join the “second line” on the way to Main Street, with a crowd of merrymakers twirling decorated umbrellas and parasols. Participation is free, with registration. Click here to grab a spot in La Porte’s biggest second line. 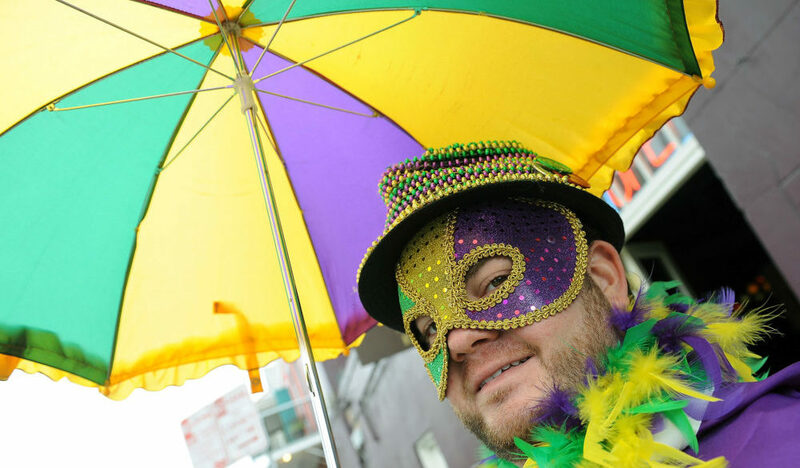 Mardi Gras on Main also welcomes partygoers to check out the Mardi Gras Market, packed with handmade arts and crafts, specialty foods, and more. The nearby Kid’s Craft Zone and inflatables will help keep kiddos occupied while parents peruse the Market. Elsewhere around Mardi Gras on Main, festival attendees can find stilt walkers, a fire juggler, giant jesters, face painting, and more while they stroll the grounds. The Pasadena-based Brigadoon Brewery has curated a row of taps featuring some of the greater Houston area’s best craft beer selections along with cider, wine, and margaritas. Not far from the main stage, Mardi Gras on Main revelers can check out the beer garden located in the middle of the festival grounds. With a drink in hand, you’ll need something to wash down and Mardi Gras on Main features a selection of several food trucks that will be dishing out grub like poboys, fusion food, cajun shrimp poutine, and more. Click here to check out the lineup of food trucks. Admission: No cover. Click here for more information. This article was sponsored by the City of La Porte. Per our advertising and sponsorship policy, we only accept sponsored content from organizations that meet our editorial standards and truly present a valuable activity, event, resource or destination for residents and visitors across the greater Houston area. Advertising revenue helps support 365 Things to Do in Houston, and our contributors, allowing us to expand our coverage of activities and events around the Houston area. Click here to learn about promoting your event or business.